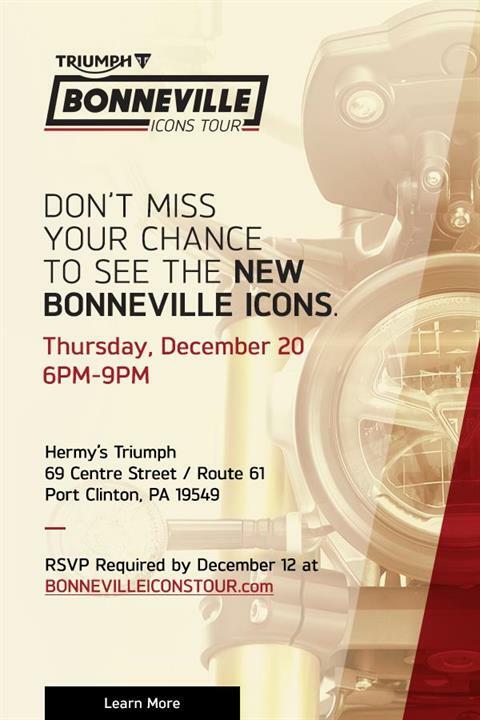 Overview: The Triumph Motorcycles national Bonneville Icon Tour will be making a stop in Port Clinton at Hermy’s Triumph on Thursday evening, December 20th, from 6 to 9pm! Triumph will be rolling out the refreshed 2019 Street Twin and Street Scrambler models along with the all-new 1200 Scrambler. Come check out the improvements Triumph has made to the 900cc Street series bikes and feast your eyes on the new 1200 Scrambler! There will be appetizers, beer, wine and soda, music and a host of artists plying their crafts for the Triumph rider. So plan to ride in and join the fun! Hermy’s sales staff will be taking deposits on the new bikes and all in-stock Triumph apparel will be on sale – just in time to have Santa stuff something cool in your stocking!